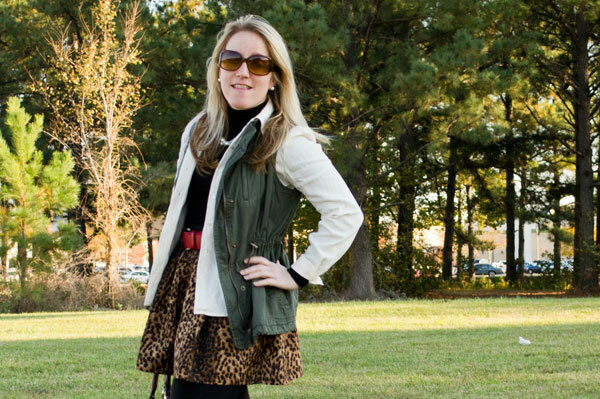 I’ve hardly gone a day this fall without incorporating a bit of leopard into my outfits. Whether it’s a belt, shoes, a skirt, a top, a jacket or just a scarf — it seems as though I’ve accumulated quite the collection of leopard over the last few years. My favorite thing about this outfit is the combination of new, old, clearance, thrifted and eBay items that comprise it. 3. Talbots shirt – 100% silk. Snatched it up at a thrift store for $2. 4. Merona turtleneck: From 2006. 5. Lucky Brand boots: They were an after-Christmas splurge in 2009. 6. Cole Haan bag: eBay! 7. 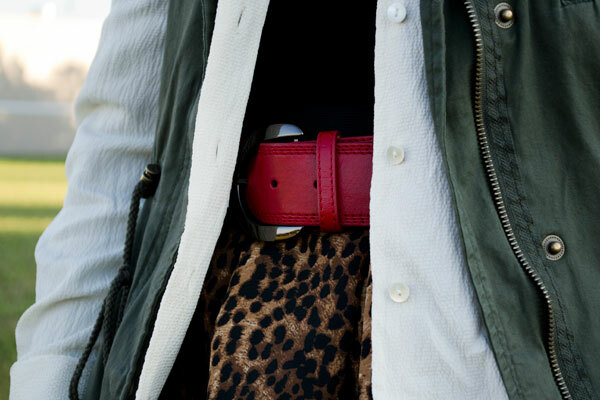 Style & Co. belt: Clearance plus 20% off coupon at Macy’s. Maybe paid $8 for it? 8. Tory Burch shades: Grabbed them at Macy’s on a day that 20% off coupons were valid for designer items.